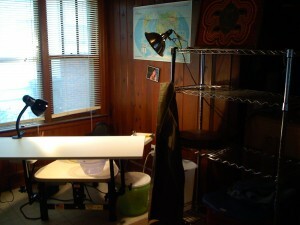 I’m back… and, now Turtle Pottery has its own studio. As some may have noticed, Turtle Pottery has been quiet since last summer. No shows, no sales, no blog entries. Well, that’s what a full time teaching job will do to your creative time. But, it’s summer and I’ve been breaking in my new wheel. The kiln has arrived. 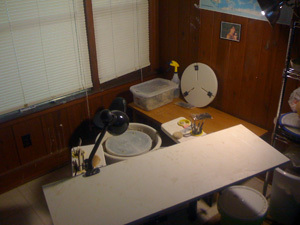 And, by summer’s end, I hope to have my first batch of Turtle Pottery studio pieces to show for it. I am grateful to Melissa Bridgman for the two years that she shared her studio and talents with me, allowing me to use her wheel anytime as well as offering me storage, glazing, and kiln space, and shared shows. Turtle Pottery would not exist without her support. So for Christmas my parents and my husband went in together and got me all the elements to set up my own humble studio. For those interested in the equipment side of things, I got a Pacifica Model GT400 Wheel 1/2HP and a L&L Kiln e23S Easy Fire electric kiln.We ordered them from Bigceramicstore.com as a package. I have been very happy with the wheel so far. I am still getting used to it. 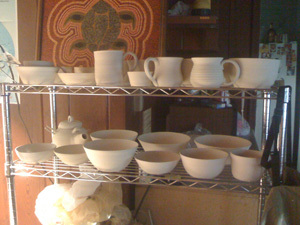 It’s been a long week of glazing and sanding and firing and glazing and firing and… well, you get the picture. The last load of greenware went into the kiln this afternoon, so sometime on Wednesday I’ll be waxing, dipping, and brushing the last of my pieces. In case you’re wondering how those mugs I was working on in the last entry turned out, I’ve got a picture. Check them out… The big bowl was being bisque fired today, so you’ll have to live in suspense and come to the show on Friday until to see it. Most everything turned out from the last glaze firing, even some of my more experimental glazing techniques. There were one or two casualities, though; lesson learned, don’t put pieces glazed in textured kiwi or any green glaze on the bottom shelf of the kiln. It’s just too darn hot down there. You can see for yourself how other pieces turned out. 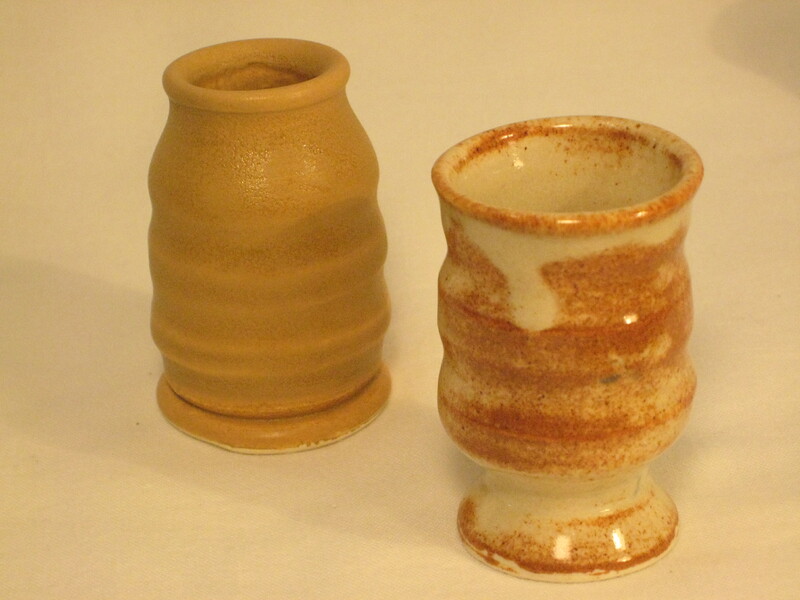 I have added a few new pictures to the pottery samples page to give folks a preview of some of the pieces that will be in the upcoming show. I took my own photographs this time, and they definitely did not turn out as well as the last batch, which Stacy took. On June 23rd & 24th, Turtle pottery had its debut at the Bridgman Studio semi-annual pottery show and sale. Friday night’s opening was more like an impromptu cocktail party, featuring wine, cheese, and good conversation with friends who’d come out to support my first show. By the end of the evening, to my pleasant surpirse, many of my best pieces were sold. Saturday we had a steady stream of people dropping in to take a look. Most didn’t leave empty handed. Between Melissa’s pieces and mine, we had a nice mix of styles. 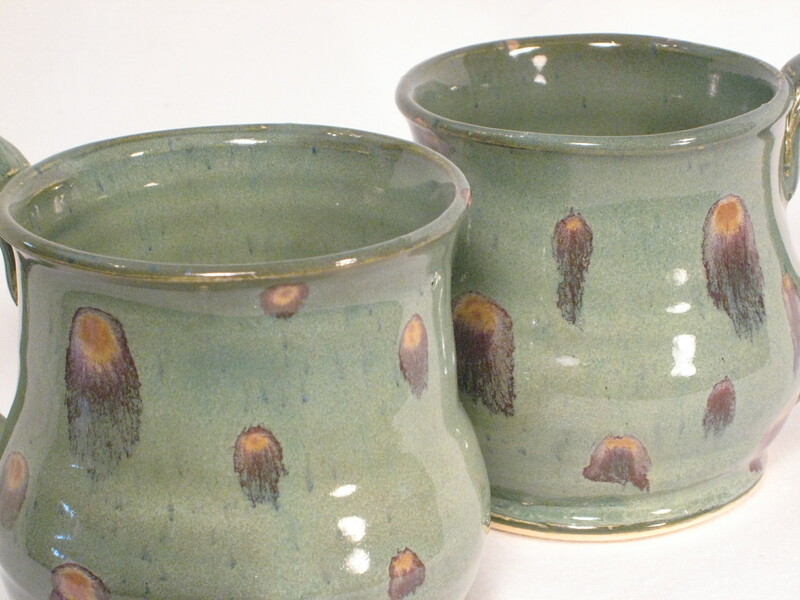 A skilled potter and hand builder, Melissa is known for her intricate leaf platters, julip cups, and bamboo pieces glazed in signature white, celadon, blue, or yellow. I wasn’t known for anything, so that was half the fun. After a year, though, my style is starting to emerge. 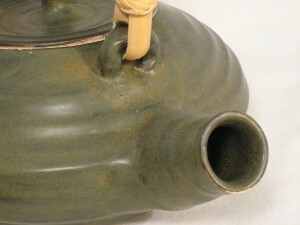 I showed teapots, bowls, mugs, and mini-bud vases. Most of my pieces are simple, useful, and sturdy. I have tended toward greens, blues, and browns in my glaze choices, which might be summaried as earthtones. Together, our pottery compliments each other – something for any taste. We had a great show and we’re already planning the next one, which will be in early November. Learning to do pottery was a graduation gift to myself. After 7 years of working on a Ph.D. and putting off doing fun stuff, the time had come to express myself in a new way. I had my first lesson in July 2005. 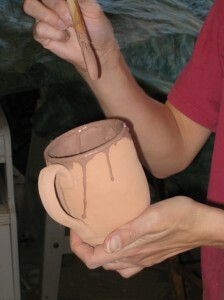 I asked Melissa Bridgman, a local potter and friend, if she’d be willing to teach me how to throw. After the first couple of lessons, I knew I’d found a new hobby. I caught on quickly and loved it! Rather than carving my initials or ink stamping the bottom of a piece, I wanted to stamp my pieces. So, I carved a turtle and that is my moniker. But, why the turtle, you ask? I like turtles, I always have. I like to think that we have some things in common – tough on the outside; soft on the inside; and relatively self-sufficient. But more than that, I’m a slow potter. I’m a slow thrower, a slow trimmer, and a slow glazer.